Nearly 3,500 miles long if it were stretched out, Maine’s irregular shoreline has a wealth of coves, cliffs, and charming towns to visit. Whatever appeals to you on vacation — inspiring scenery, wide beaches, lighthouses and historic sites, arts and antiques — you’re likely to find it in one or more of these distinctive coastal destinations, featured from north to south. Savor Maine’s signature seafood in the self-proclaimed lobster capital of the world. Tons of the shellfish are hauled in during the season, and true obsessives can attend the annual Maine Lobster Festival or opt for a special package at the Berry Manor Inn that includes going out with a lobsterman, setting the traps, and touring a lobster pound back at the wharf. Those who are happy simply eating a lobster roll may still want to get out on the water. Hop on the Maine State Ferry to Vinalhaven, explore, and then sail back amidst the painterly views of lighthouses dotting Penobscot Bay. Art aficionados should make time to visit the Farnsworth Art Museum, which includes works by N.C. Wyeth and Louise Nevelson in its collection. Lighthouse fans coming to Maine would be remiss to skip visiting the historic Owls Head Light, which was first erected in 1825 to help boats navigate Penobscot Bay and was rebuilt a generation later. It stands 100 feet above Rockland Harbor, and from Memorial Day through Columbus Day visitors can climb all the way up to the lantern room. The light keeper’s home has been converted to an interpretive center, where you can learn more about this navigational aid and the life of a lighthouse keeper. While in this charming Maine town, also check out the Owls Head Transportation Museum, which collects and exhibits planes, motorcycles, bikes, horse carriages, automobiles, and more built before World War II. 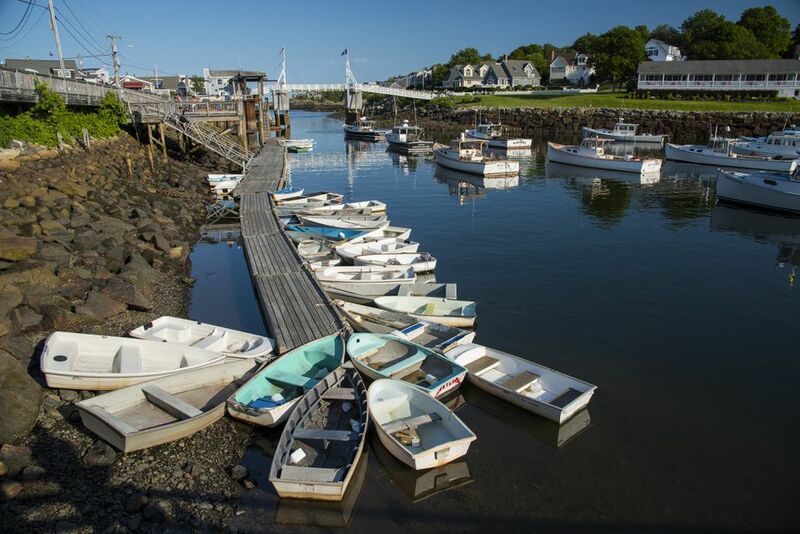 Come down to the bustling harbor and climb aboard: Known by some as the boating capital of New England, Boothbay offers sea-loving travelers a bounty of ways to catch a wave. Boat excursions leave multiple times during summer days, offering passengers opportunities to see whales, seals and puffins up close. Go kayaking on one of the many calm inlets and rivers, catch a ride and help hoist a sail on a windjammer, ogle mega-yachts, or romantically celebrate day’s end on a sunset schooner. Learn more about what lives under the sea at the Maine State Aquarium, which boasts a rainbow collection of lobsters and a “touch tank” where you can practically shake hands with a squid. On an island of the same name that lies 10 minutes south of Bath and 45 minutes from Portland, the town of Georgetown has 82 miles of jagged shoreline jutting into Casco Bay. Easy to reach, the town is connected to the mainland by bridges. Its 770-acre Reid State Park contains long, wide, sandy beaches and was rated #1 in New England for surfing by The Boston Globe. For sustenance, stop by Five Islands Lobster Co. for fresh, local fried clams, mussels, lobster and other fruits of the sea. Overnight guests can stay at a bed and breakfast, historic inn, Airbnb, or even have the unique sensation of being rocked to sleep on a houseboat moored in Riggs Cove at Derecktor Robinhood Marina. Ten miles from Portland (although you'll need to hop a ferry to reach it, and that ride takes at least an hour), Chebeague Island is a true getaway-from-it-all destination. Once you arrive on the island, which measures just 24 square miles, follow the circular route around the perimeter on foot or a bike. Summer is the time to visit, as the weather is best and blueberry bushes are in bloom. The road leads past some stately Greek Revival homes; the circa-1920 Great Chebeague Golf Club, which has water views from its nine holes; and the Museum of Chebeague History, which reveals the island’s heritage of fishing, farming and shipbuilding. Stop for lunch or drinks at the restored Chebeague Island Inn, which is nearly a century old. The work of local artists enhances guest rooms, and wicker chairs on the wide veranda invite visitors to admire the sparkling waters of Casco Bay. Less than 30 miles from Portland, Kennebunkport is small and walkable, although you can tour this maritime town the old-fashioned way via trolley or horse-and-carriage ride. At restaurants around town, an array of Maine treasures are sure to tempt: lobster in all its scrumptious forms; oysters; cheddar cheese; blueberry pancakes, pie, and smoothies; corn and clam chowders; and more. Sophisticates can have their palates pleased by creative concoctions such as tuna poké in the round at the Tides Beach Club. Layered with avocado, seaweed, soy, wasabi aioli, and topped with crisp fried wonton slices. Be sure to stay a while: Kennebunkport features a diverse selection of accommodations that range from historic houses to ocean-view inns to luxurious bungalows nestled in the forest. Named one of the best little beach towns in Maine by Coastal Living, Wells is the third-oldest town in the state. Swimmers, sun worshippers, shoppers and nature lovers will all find ample places to explore. The town boasts three public beaches that stretch for miles. Antiques shops and bookstores will have visitors scouting rare treasures. Birders who visit the 9,125-acre Rachel Carson National Wildlife Refuge are likely to spy flocks of migratory birds, and endangered piping plovers nest on nearby beaches. Miles of trails along the coast and into the woods at the Wells National Estuarine Research Reserve at Laudholm are open year-round for hiking. Called “beautiful place by the sea” by the Abenaki tribe, its original natives, LBGTQ-friendly Ogunquit draws visitors thanks to its 3-mile-long, peninsular beach that lies between the Atlantic Ocean and Ogunquit River. Those who find the water soothing ought to stroll along the Marginal Way, a cliff walk with benches for pausing and taking in the view of the town’s magnificent coast. The beauty still inspires today’s professional and developing artists; Impressionist Charles H. Woodbury established a summer painting school here in 1898 that found new life in the 21st century as the Ogunquit Summer School of Art. Cornerstone restaurant is the place to savor your first fig pizza. One of the state's prettiest seaside resorts, York (comprised of Old York, York Beach, York Harbor, and Cape Neddick) in southern Maine is only 8 miles beyond Portsmouth in New Hampshire, 45 minutes south of Portland, and 55 miles north of Boston. Nubble Light, said by some to be the most beautiful lighthouse in America, separates the popular Short Sands and Long Sands beaches. (Beachgoers in search of greater seclusion can put towels down on Cape Neddick and Harbor Beaches.) Dried off and dressed, stop in for "kisses" (saltwater taffy) or a mix-and-match box of chocolate treats at The Goldenrod in York Beach. The candy store/restaurant also features a dining room serving comfort-food classics at breakfast, lunch, and dinner. You can also spend a day in York whale watching, canoeing, biking or hiking. Yes, you can combine a search for bucolic sea views and exhilarating adventures with a hunt for deep discounts. Right across the New Hampshire border, between the Atlantic Ocean and the Piscataqua River, Kittery has more than a half-dozen different multi-outlet centers strung along Route 1. They feature a plethora of brands to outfit yourself and your family from head to toe. Once decked out in sailing gear, head for the harbor to take a ferry tour of the southern Maine shoreline. For a swinging time, visit Take Flight’s Aerial Adventure Challenge Course, which features more than 65 gravity-defying activities.